DesertPeace condemns the senseless killings of these innocent youth. NOTHING positive can come out of this except for Israel where the aggression and occupation will continue indefinitely as a result. Our hearts go out to the families of these boys. Eyal Yifrach, 19, Naftali Frenkel, 16, and Gil-Ad Shaer, 16, went missing near Hebron on June 12; blaming Hamas, Israel had spent past 18 days in extensive search of West Bank. IDF troops on Monday located the bodies of the three Israeli teens who went missing on June 12 while hitchhiking in the Hebron area of the West Bank. The bodies of Eyal Yifrach, 19, Naftali Frenkel, 16, and Gil-Ad Shaer, 16, were found in the Hebron region of the West Bank, not far from where they were believed to have been abducted. Shortly before the announcement that the bodies had been found, the IDF said it was searching intensively in the area of Beit Kahil, north of Hebron. The Israeli government had mobilized quickly on multiple fronts to locate the three boys, launching a massive social media drive using the hashtag #BringBackOurBoys, and enlisting international support. Even Palestinian President Mahmoud Abbas condemned the abduction and demanded the boys’ return. Meanwhile, the IDF embarked on exhaustive searches of the West Bank, arresting dozens of Hamas operatives and ransacking the organizations offices as part of what it called Operation Brother’s Keeper. Prime Minister Benjamin Netanyahu had blamed the Islamist group almost from the moment the three boys went missing, and several days ago Israel released the names of two suspects in the kidnapping, both allied to Hamas. 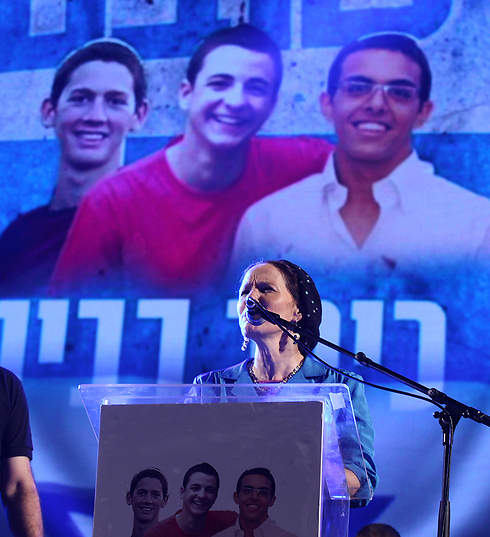 On Sunday night, tens of thousands of Israelis gathered in Rabin Square in Tel Aviv to support the families and demand the boys’ return. The Israel Police had come under fierce criticism after it emerged that an emergency call from one of the boys in the night they disappeared saying that they had been kidnapped was ignored. The police did not inform the IDF or Shin Bet that the boys may be missing until Gil-Ad’s father arrived at the local station at 3am, some five hours after their disappearance. Carol and Osama are good friends; it’s sad to see them leave, physically that is. I am constantly asked by visitors, what I think the ultimate goal of Israeli actions on the ground is. Well, this is it. The goal is for us to leave or vanish–no less. Given we will do neither, collectively, as a people, buckle up for the long haul. Humanity must prevail before peace pokes out its head. As a Palestinian Israeli married to a Palestinian, we’ve been waiting for Israel to grant us permission to live together. 15 years later, forced to choose between homeland and family unity, we have finally left. Carol Daniel Kasbari and husband Osama with two boys. After fifteen years of waiting, my husband and I have finally begun our life together. We have left Jerusalem for good. I am a Palestinian with Israeli citizenship, raised in Nazareth. My husband is also a Palestinian, but unlike me, he is not a citizen of Israel. In fact, he is not a citizen of any country. I met my husband, Osama Kasbari, in Ramallah in 1997 when I was a student at the Hebrew University, and the connection was immediate. After that first meeting, we spent three hours talking on the phone – about life, identity, language, home – and within a year, we were married. We began the process of building a normal life, applying for “family unification,” a process under which non-citizens married to Israelis could gain temporary residency status and further on down the line become permanent residents or citizens. At the Interior Ministry office in Nazareth, we were told that the process would be quite simple: We were to live inside of Israel’s borders, pay taxes, obey the laws and within four years, my husband would be granted permanent residency. This is what we were told, and this is what we believed, so this is what we did. My husband was granted an Aleph/5 permit, a temporary status which enabled us to live together. He was one of those “good Arabs,” according to the Shin Bet, who reviewed our application to renew his permit. Every year, before the permit expired, I would spend an entire week on the phone, until I finally reached the clerk who would schedule an appointment for us at the Interior Ministry. The grilling would begin on the phone, and end in a day-long visit to an office where we submitted a pile of papers that revealed every detail of our life: Three months of a protracted, demanding and exhausting process. It involved explaining every move and every payment we made. 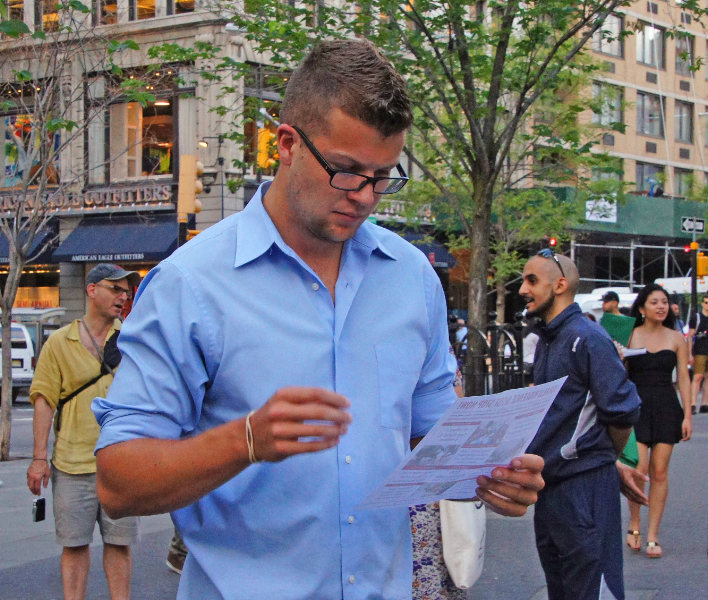 We felt we were at the mercy of clerks and strangers who passed judgment on our life choices. My husband couldn’t leave the country, buy a house and or even open a bank account or pay his own cellphone bill. In 2003, weeks before my husband was scheduled to receive permanent residency, our dreams were shattered, along with other Palestinian couples like us. On July 31st, 2003, then-Interior Minister Eli Yishai successfully passed the “Citizenship and Entry into Israel Law (Temporary Order)” which categorically denied Palestinians from “the hostile areas,” meaning, Jerusalem, West Bank and Gaza, the ability to receive residency or citizenship as a result of their partnership with a citizen of Israel. The initial reason provided was purportedly connected to security: One man in such a situation had been involved in a bombing in Haifa. The law was scheduled to last for a year, with the option to be renewed for an indefinite period at the end of the year. No other Palestinian who is in a family unification process has acted any act of terror or assault since 2003, yet the emergency law has been renewed every year until this day. We were devastated. We had come so close to achieving some degree of normalcy for our family, which by then had expanded to include my two little boys, and suddenly we found ourselves waiting, again, for a political decision that would directly affect our personal lives. Eventually, we filed a petition to the Supreme Court. The judges, too, expressed sympathy for our case. They said it was terrible, it was unfair, that we deserved better, and they suggested to the State Attorney that we find a compromise outside of the court that would allow my husband receive permanent status. The latter rejected this suggestion immediately: If we find a compromise with them, he said, we will open up the floodgates, and set a “dangerous precedent.” Our appeal was rejected. So was this law truly about “security,” or was it about demography? In 2012, the Supreme Court collectively rejected every appeal against the law. They acknowledged that the law violated the principles of equality, but, as Judge Asher Grunis wrote, “[H]uman rights are not a prescription for national suicide,” referring to the “demographic threat” to the Jewish State posed by people like my husband. The treatment of our issue was humiliating and dealt with as a disease and a threat to Jewish existence. We couldn’t tolerate it anymore. This year, after 15 years of waiting and struggling, of living with insecurity, fear, and harassment, we decided that enough was enough. We did not renew my husband’s temporary residency. Instead, we left the country and started looking for a permanent life in a place where would be welcome, wanted and respected. We moved to the United States, and bought a house in Virginia, something we had realized we may never have been able to do in Jerusalem. We knew this decision would possibly carry life-long consequences, as my husband would not be allowed to return to Jerusalem or Nazareth anymore. I have given up my right to bring up my boys in this country or to live my life close to my family and friends. I haven’t given up on my Palestinian roots or on my homeland, but on the suffering of being minority in a country that doesn’t respect the rights of others who are not Jewish. Now, when I return to Jerusalem for a visit, I feel numb. My family – and the thousands of other families like ours – had to make the choice between a normal, full life abroad and a temporary life in our homeland. That is a choice no family should have to make. Carol Daniel Kasbari is a conflict transformation specialist and veteran facilitator for groups in conflict in the Middle East since 1995 and has spoken about her work in this TEDx talk in Jaffa. Born in Nazareth, she holds a Masters degree in NGO Administration and Public Policy from the Hebrew University of Jerusalem and is pursuing Ph.D studies at George Mason University in Conflict Analysis and Resolution. 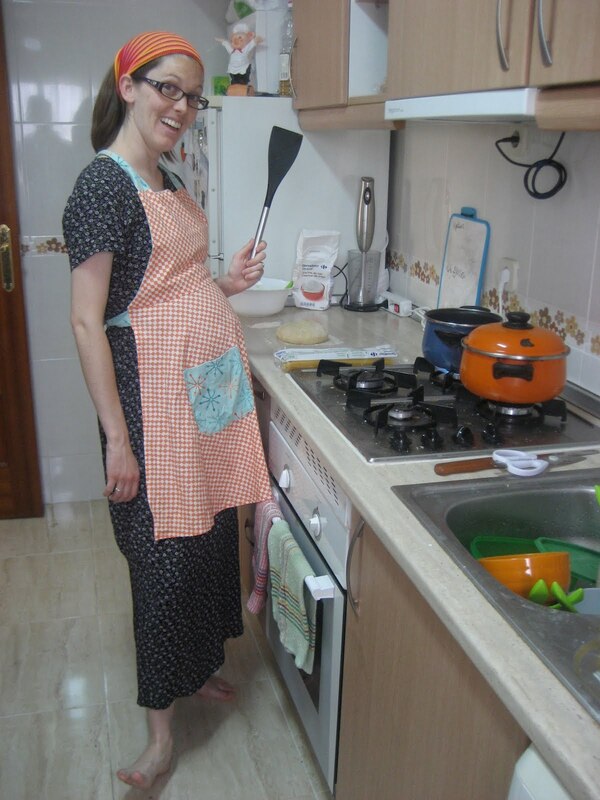 She currently lives near Washington, D.C., with her husband, Osama Kasbari, and their two children. 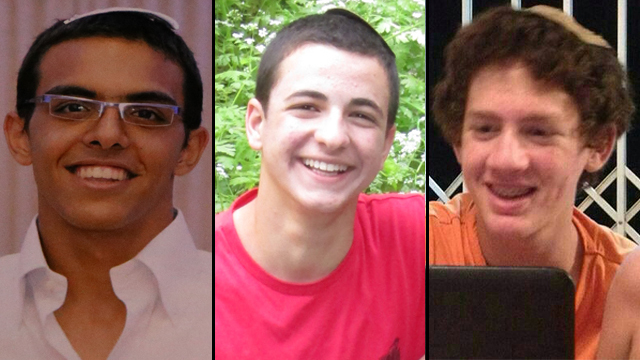 … Therefore, the three missing Israeli teenagers should be considered to be Prisoners of War …. as should the hundreds of innocent Palestinians languishing in Israeli Military Prisons. The collective punishment inflicted on the Palestine people before and after the abduction of the three youth has been tantamount to a declaration of war against Palestine. As stated above, they must be Released quickly after conflicts end. In other words, the ball is in Israel’s court, so to speak. If Israel wants to see a just end to the abduction, it must make moves to end the conflict and the occupation. An eye for an eye will only leave many people on both sides blind. To the surprise of all involved, not even one passerby mentioned the missing teenagers … the demonstration was met by friendly response. 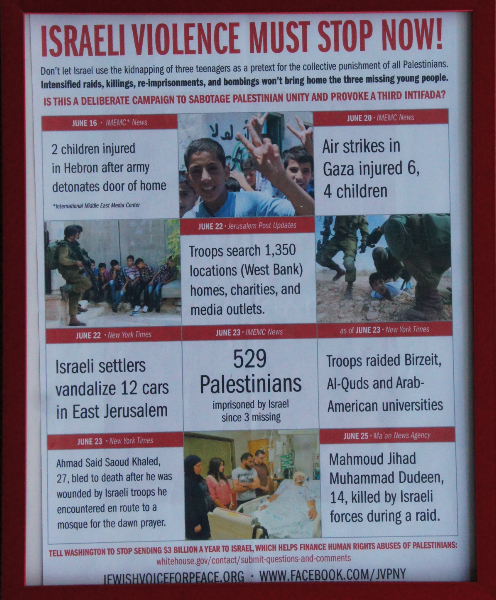 The following appeared in today’s Jerusalem Post …..
What is happening in Palestine is not about three missing youth but rather power, control, propaganda, and colonization. By only choosing to look at the three missing youth, we become blinded to the larger picture and context of what is happening in Palestine. So let us examine the events leading up to last week. More than 300 Palestinians have been arrested and detained by the Israeli military since last Thursday — including over 50 that were released in the Gilad Shalit deal — in clear violation of the agreement. Over 750 homes in the Hebron area alone have been “searched” and invaded. On Thursday night, Birzeit University was targeted and searched. The streets of the West Bank are crawling with 18-20-year-old Israelis armed with machine guns, and all rights have been suspended as the soldiers enter, search, arrest, and beat as they like. In addition, a few days ago a 21-year-old was killed by the military, while on Friday two youths were shot dead in home raids. On Sunday, two more Palestinians were shot dead. Meanwhile, Gaza, which has been under siege since 2007, is experiencing daily airstrikes. Israel claims that this is all a response to three Israeli youth going missing last week, in an apparent kidnapping. Even if you choose to believe that this is the reason for the above, it is an extreme response which is collectively punishing all of the Palestinian people. In addition, one might question why in the media the youth who were “illegal” Israeli settlers are called “kidnapped” in their disappearance, while Palestinians who are taken are referred to as “arrested” — but that is a discussion for another time. This past year peace negotiations fell through as Israel walked away from the table when Hamas and Fatah signed a unity agreement. Although Israel claims that the issue was that they cannot “negotiate” with a terrorist organization, their continual construction of illegal settlements in the West Bank reveals their commitment to peace and international law. Settlement expansion actually reached new records in 2013 and by March 2014 the rate of expansion was already surpassing 2013. After Hamas and Fatah signed the unity agreement and formed a new government, Mahmoud Abbas reiterated that the PA was still committed to nonviolence and would still recognize the state of Israel. By backing the deal, Hamas was no longer a “militant” group outside the PA seeking the destruction of Israel. The siege on Gaza was previously “justified” by Israel because of Hamas’ rule in Gaza, yet with this new government committed to nonviolence and control over all Palestinian territory, the siege could no longer be justified to the broader international community. Suddenly, the reason behind the siege is revealed. It is not about stopping terrorism or hurting Hamas, rather it is about power and control. With the unity agreement, Israel looks like a war criminal. Before last week, over 125 Palestinian prisoners have been on hunger strike in Israeli prisons. They are protesting being held without charge or trial. The strike has continued for nearly 60 days and has been gaining momentum and attention in international media. To be held without trial or charge is in clear contradiction to international law. The prisoners through their mass nonviolent action and sacrifice are drawing attention to the daily realities of Palestinian life. With the current incursions in the West Bank, however, few international media outlets are talking about the hunger strike. Negative attention has been diverted. 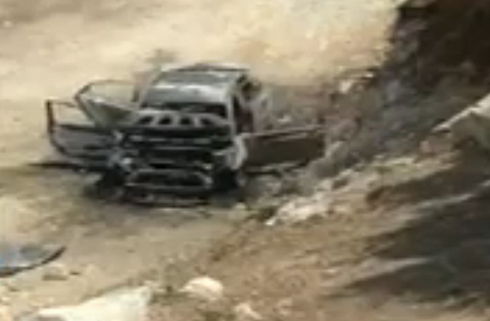 On May 15, two Palestinian youth were shot and killed with live ammunition. Local security cameras caught the images of the youth shot in the back, posing no life threatening risk to any Israeli media personnel. Meanwhile, CNN caught the soldier fire the shots at the youth. Human Rights Watch is saying the killings could amount to war crimes. Israel’s public image has taken a beating the past few months as the international community is starting to become aware of the apartheid system and colonization of Palestine. These recent kidnappings have been an opportunity to shift its image again, from aggressor back to victim. Yet while the Israel cries out victim while sending hundreds, if not thousands, of soldiers to invade homes, one can only speculate what the response is actually about. Firstly, this action could be an attempt to force a divide within the ranks of the newly-formed government. Through the raids in the West Bank, Israel has repeatedly targeted homes and building of Hamas and accused Hamas of being behind the abductions, even though there is no proof as to who is actually behind the disappearances. With Hamas members being targeted, it could weaken the newly-formed government, thus causing a divide that could once again delegitimize the PA at the international level and “justify” the siege on Gaza. Secondly, this could be an attempt or preparation to completely re-occupy the West Bank. 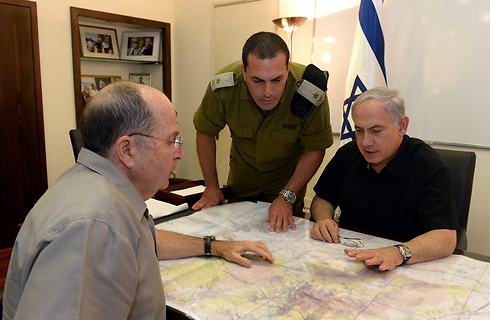 Israel could be using this as an opportunity to re-navigate Area A and re-assert its control. Such a mass military response and invasion, begins to look like a fact-finding mission where soldiers begin to navigate the lay of the land and assess what the local response to an invasion currently looks like. Thirdly, it sends a strong message that despite prevailing notions of international law and signed past agreement, Israel is in control and will continue to exert its control and dominance throughout all of Palestine. It is a reminder that from the Galilee to Eilat, Palestine is under Israeli control and Israel experiences full impunity from the international community. The future of Palestine is uncertain. However, what is clear is that this is not about three settlers going missing. Rather this is the continuation of the prevailing reality on the ground, a reality of colonization that is enforced by a brutal military offered full impunity by the international community. 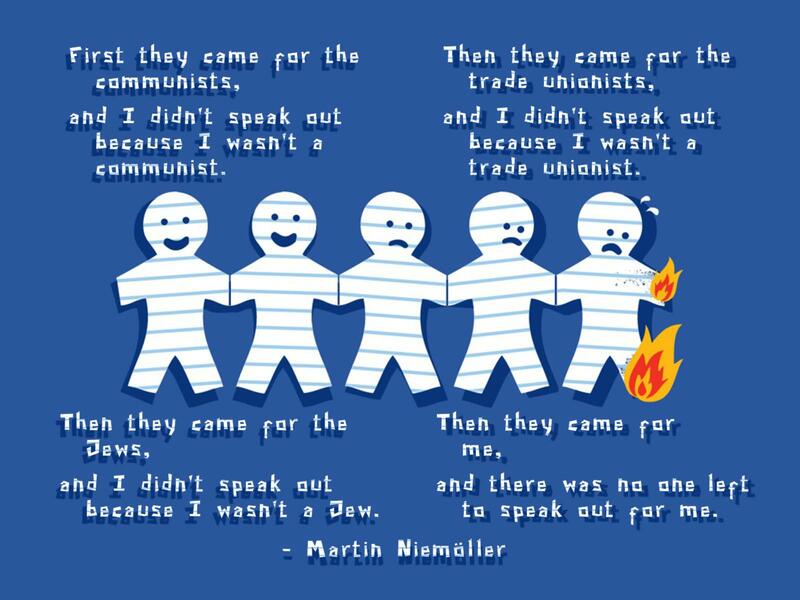 This past week has made public both the power and brutality of Israel, and also how the international community is completely silent to what is happening. This is not about three settlers going missing, but rather about the continued racism and colonization of Palestine with the support of the international community. Despite the vocal or silent support of Israel, it is up to us the masses to express our condemnation and hold Israel accountable. It is up to the people to speak to truth about what is happening and reveal the larger picture of oppression. The victory of the divestment campaign in the Presbyterian Church (USA) on Friday shows us that this possible. It is up to us, however, to push forward the boycott, divestment, and sanctions of Israel on all levels in every country, and show the Israeli public that we refuse to tolerate the crimes being perpetrated against the Palestinian people. What a cruel world: Three yeshiva students were kidnapped, and the world isn’t interested; three mothers are crying out, and the world doesn’t answer. It’s all because the entire world is against us; it’s anti-Semitic and hates Israel. The Anti-Defamation League is already preparing a report. But the truth is, that’s just the way things are: When you openly thumb your nose at the world for years on end, eventually, it thumbs its nose back. Israel is discovering that it’s no longer the center of attention as it always was before. The three mothers went all the way to Geneva. 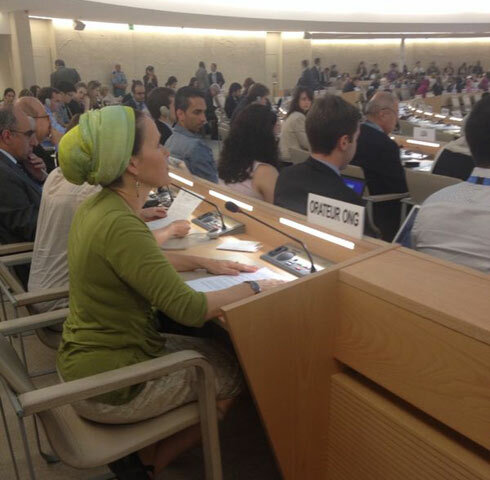 One of them went abroad for the first time in her life to go to the United Nations Human Rights Council. But the world, and the council, went on their merry ways. It’s the irony of fate: About two years ago, Israel officially suspended cooperation with that council; together with the Marshall Islands, Palau and the U.S., it opposed the council’s very establishment. But now, in its distress and the mothers’ distress, it has turned to the council, which is indeed hostile to Israel and spends more time on it than on any other country. Suddenly, Israel needs the world. It even needs the UN, which all of a sudden isn’t the worthless body Prime Minister David Ben-Gurion once termed it. 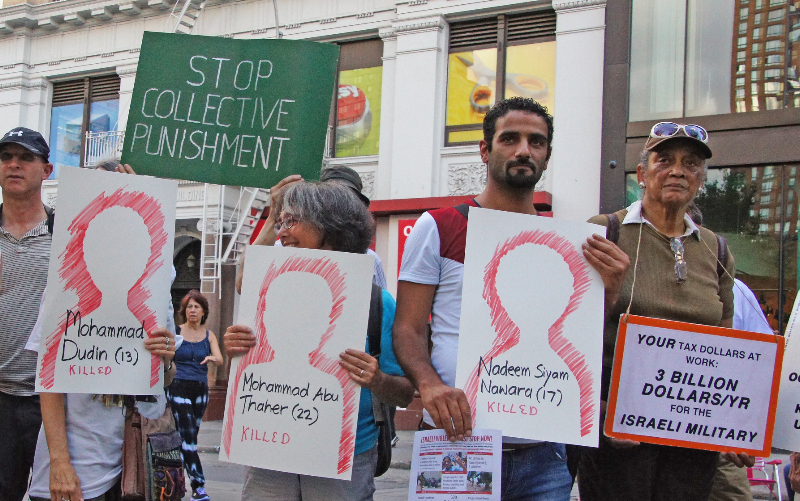 It takes considerable effrontery to demand that the world interests itself in the fate of three abducted Israelis, and considerable chutzpah to be disappointed by the fact that it has kept silent. Granted, Israel tried to move heaven and earth, and its ambassador/propagandist at the UN gave a moving speech in an effort to scrape up a few more public diplomacy points against Hamas. But once it was paying attention already, that bizarre world was more interested in the campaign of collective punishment imposed on thousands of West Bank residents after the kidnapping. That’s the way things are with the world-that’s-entirely-against-us: It’s more interested in the half-century-old occupation; it’s more upset over the fate of three million Palestinians than the fate of three Israelis. The world has no lack of kidnapping victims, but none of them ever got the attention received by kidnapped soldier Gilad Shalit. With the three current kidnap victims, however, Israel no longer had a chance. Over the last two weeks, which I spent in Sweden, I didn’t run across a single mention of the abduction in the media. Not one. That’s what rotten fruit looks like. The world has no reason be more interested in the fate of Naftali Fraenkel, Eyal Yifrah and Gilad Shaar than it is in the fate of their age mate Mohammed Dudin, a boy of 15 who was killed by live fire from Israeli soldiers in Dura last Friday. It has no reason to be especially moved by the haunting words of Rachel Fraenkel, who related that her Naftali is a good boy who loves to play guitar and soccer, when Mohammed was also a good boy, who helped his father build their house during his school vacations and sold sweets to help support his family. Rachel wants to hug Naftali? Jihad, Mohammed’s bereaved father, also wants to hug his son. Incidentally, nobody brought him to Geneva. He remained alone with his mourning, at the wretched house whose construction hasn’t yet been finished, and perhaps never will be. The world is a mess, as they say. In Iraq, Nigeria, Syria and even Ukraine, the situation is far crueler. Yet the complete lack of interest in the kidnapped Israelis doesn’t stem from that alone. It’s impossible to demand sympathy from the world when Israel ignores the world’s decisions; it’s impossible to demand action when Israel is perpetuating the occupation; and it’s impossible to demand solidarity with the fate of Israeli victims when that same victimized Israel continues to kill, wound and arrest innocents as a matter of routine. Now Israel is discovering that it’s no longer the center of attention as it always was before, and that the fate of its kidnapping victims no longer stops the world in its tracks, not even in the United States. The world is sick of Israel and its insanities. Unfortunately, the world has also lost interest in what happens here. When Israel was a more just country, the world identified with its victims. It continued to do so even when Israel became less just. But now, when Israeli rejectionism is hitting new heights and its oppression of the Palestinians is returning to what it was during the very worst periods, the world has started getting tired of it all. Even the kidnapped Nigerian girls interest it more. Where is the world’s outcry to BRING THESE BOYS HOME? Is this not a form of kidnapping? RAMALLAH (Ma’an) — The number of Palestinian children in Israeli jails has surpassed 250 in the wake of the ongoing military search campaign in the West Bank, a Palestinian Authority lawyer said Tuesday.”Israel is violating international children’s rights agreements by detaining Palestinian minors, and it is trying to cover up these violations with the story of the three missing settlers,” Hiba Masalha said in a statement.The Israeli army launched a massive military campaign in the West Bank following the disappearance of three Israeli teenagers from the Gush Etzion settlement on June 12. Israeli forces have arrested hundreds of Palestinians and killed five throughout the search for the teens, who Israel alleges were kidnapped by Hamas.”Detaining Palestinian children from their houses in the middle of the night without informing their parents and families of the reasons for their detention is kidnapping,” Masalha added. The statement said Palestinian children are often subjected to violence upon being arrested and interrogated in Israeli prisons. Sixteen-year-old Talal Khalid Sayf was detained on May 3, 2014, and claims to have been beaten badly by Israeli soldiers during the arrest process, the statement said. 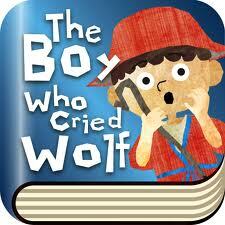 Sayf was left with his nose and mouth bleeding, and was also struck in the stomach and back. Islam Mahmoud Haimouni, 17, was detained from his home on Dec. 18, 2013, according to the statement. He was taken from his home into an Israeli military vehicle and beaten until he lost consciousness. Sixteen-year-old Hassan Sharif Ghawadrah was beaten so badly during his detention on Nov. 13, 2013 that he was taken to the hospital, before spending 15 days in solitary confinement, the statement said. Additionally, an interrogator in Huwwara prison beat 17-year-old Musleh Hatem Mifleh in the face and pulled his hair until he confessed, the statement said. zionism is today confronted with its greatest challenge since 1948. It’s not coming from the Arab states or the Palestinians, but rather their problem is the American Jewish community itself. Once the greatest support group for Israel, that support is dwindling daily as more and more Jews openly support the Movement to Boycott and Divest from Israel. 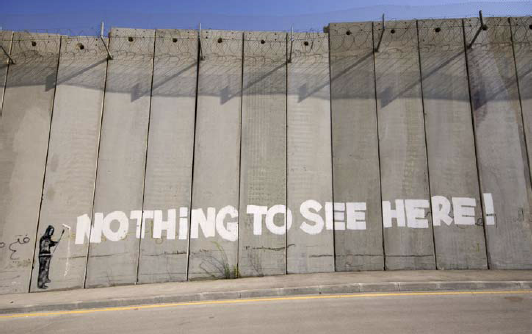 As the government of Israel continues its reign of terror against the people of Palestine, as more lands are stolen to build and expand the illegal settlements, a growing sector of Jewry is finally waking up to the fact that this is all wrong …. and are doing something about it. The growing support from Jews internationally for the BDS call and the boycott of Israel shows that the landscape of the debate around BDS and broader peace process in Israel-Palestine is shifting. Increasingly the question is no longer whether or not to boycott, but rather to what extent do we boycott? The emerging local and international constituency of Israeli Jews and the Jewish Diaspora, and their adoption and promotion of a range of methods that fall within the scope of the BDS campaign is significant. On the surface, this wide-ranging support of course reminds us of how non-sensical and futile it is to deploy classic anti-Semitic imagery in an attempt to delegitimize what is a growing international movement for human rights and legal equality. 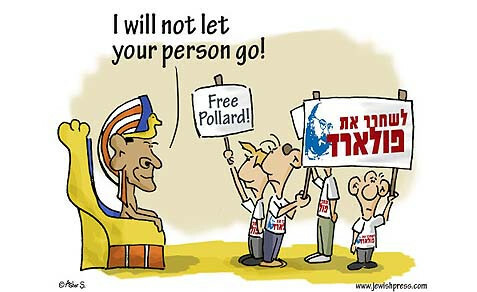 At a deeper level, however, this growing Jewish support is an indication that the spirit of the boycott call reflects a truly democratic vision that is shared by Jews internationally, a call that wants to see the preservation, not the demise, of a democratic Israel, an Israel that fairly represents all of its citizens, regardless of race or religion. Ignoring these efforts by Jewish organizations and individuals to promote democracy, human rights and a just peace in the Middle East is a dangerous mistake. Clearly in conflicts such as Israel-Palestine, governments don’t always have all the answers: free speech and open criticism of government policy is critical. Given the lack of success of official diplomacy in the region we should be encouraging, not dismissing, these growing local and international efforts. A couple of weeks ago Jerusalem-based think-tank, the Jewish People Policy Institute, released the findings from its study “Jewish & Democratic: Perspectives from World Jewry”. 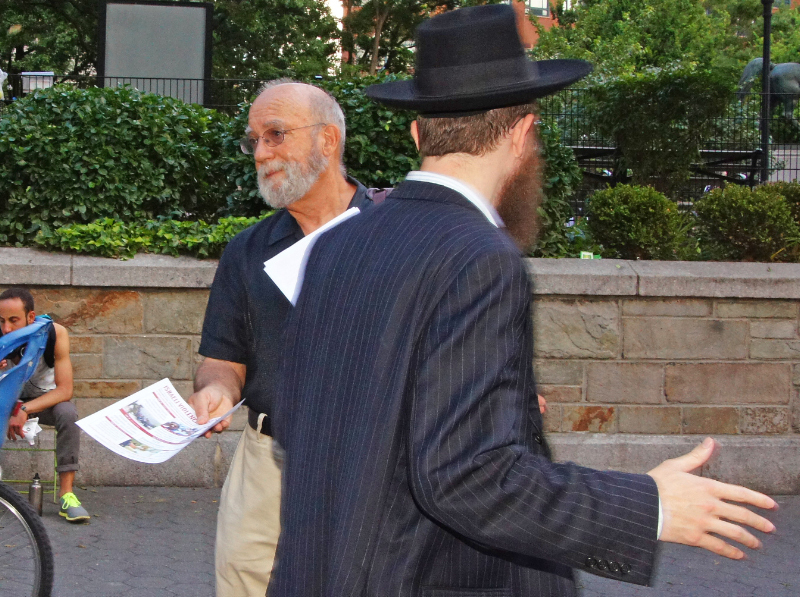 The key findings demonstrate a growing trend towards a concern for the current Zionist policies of the Jewish state from the core of its international supporters—Jews themselves. This reveals a more critical portrayal of Israel’s “implementation of Jewishness” than ever before, including a growing tension associated with the idea of a state that is both a “Jewish” and “democratic”. Participants of the study said that Israel’s occupation of the West Bank and “the continued building of Jewish settlements”, as well as its treatment of minorities falls seriously short of behavior expected from a democracy. The Jewish-only settlements are of course not only frowned upon by a growing number in the Jewish community, but also considered illegal by a large majority of states (as most recently demonstrated in UN General Assembly Resolution 68/82). Although Israel and its chief ally the United States continue to contest this, even U.S. officials blame Israeli settlements for the collapse of the latest round of Israeli-Palestinian negotiations. There also appears to be an emerging consensus among government officials in Israel, Palestine, and the U.S., as well as among legal experts, that Israel and especially the Palestinian territories are in—or are rapidly heading towards—a situation of apartheid. Unfortunately the extent of this new reality of Jewish criticism of Israel’s policies towards Palestinians that is taking hold appears largely unreported by mainstream media. One place where opposition to Israel’s policies finds concrete expression amongst Jews both within Israel and internationally is in a wide range of boycotts and divestments activities aimed at promoting legal equality and human rights in Israel-Palestine. 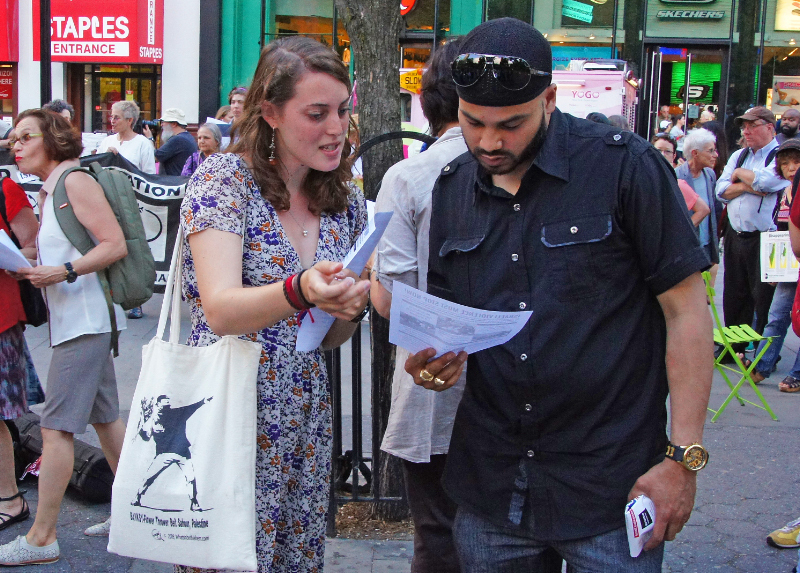 Though not necessarily always explicitly linked to the boycott, divestment, and sanctions (BDS) movement, these activities do fall within the scope of the movement and help to advance its goals. The call for boycott, divestment, and sanctions came in 2005 from an unprecedented coalition of over 170 Palestinian civil society organizations including NGOs, unions, professional associations, religious groups, human rights organizations, refugee networks, youth, and cultural organizations. The BDS campaign has three goals: an end to the occupation of Arab lands occupied by Israel since 1967, full equality for Arab-Palestinian citizens of Israel, and the right of Palestinian refugees displaced or expelled during conflict in the region to return to their homes and properties as stipulated in UN Resolution 194. The BDS movement was launched on the one year anniversary of the landmark 2004 International Court of Justice case that found that Israel’s occupation of Palestinian territory is illegal under international law. In addition to the large majority of the world’s countries, a wide range of legal experts and Israeli and international NGOs concur on the illegality of the occupation. 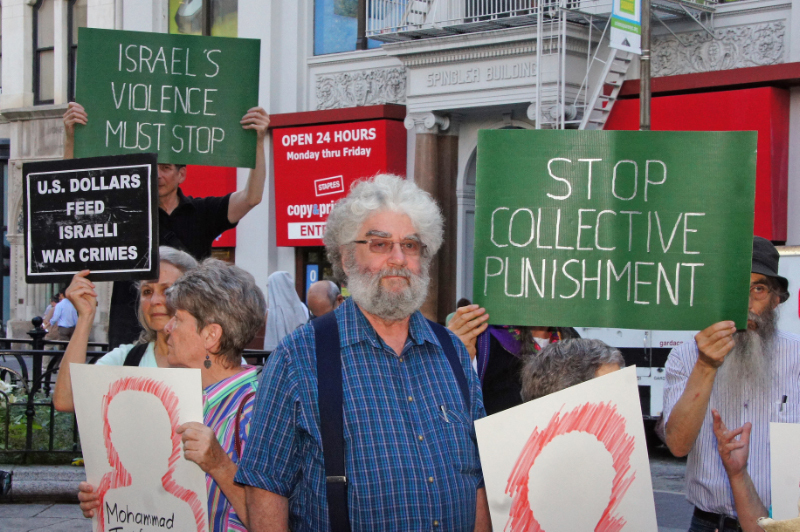 In this article we explore the growing Jewish support for both the BDS movement and other civil society boycott activities which advance the human rights goals of the movement. While not all of the individuals and organizations we mention actively support every aspect of the boycott, divestment and sanctions campaign, they represent a multi-faceted approach to applying international pressure on Israel to abide by international law and human rights treaties. 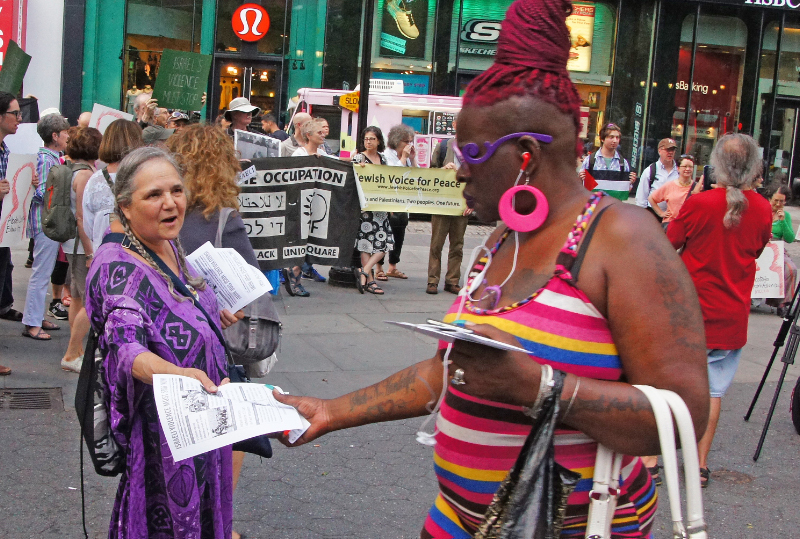 In the United States where debate over the boycott, divestment and sanctions movement is heavy and heated, Jewish Voice for Peace, a coalition of Zionists, anti-Zionists, and non-Zionists, states clearly that it aligns itself with the methods as well as “the aims of the Palestinian Boycott National Committee– ending the occupation, achieving equality for Palestinians now living in Israel, and recognizing Palestinian refugees’ right of return.” Others in the U.S. who support the full goals and strategy of the BDS campaign include, both Rabbi Lynn Gottlieb and Rabbi Brian Walt, from the Jewish Voice for Peace’s Rabbinical Council. 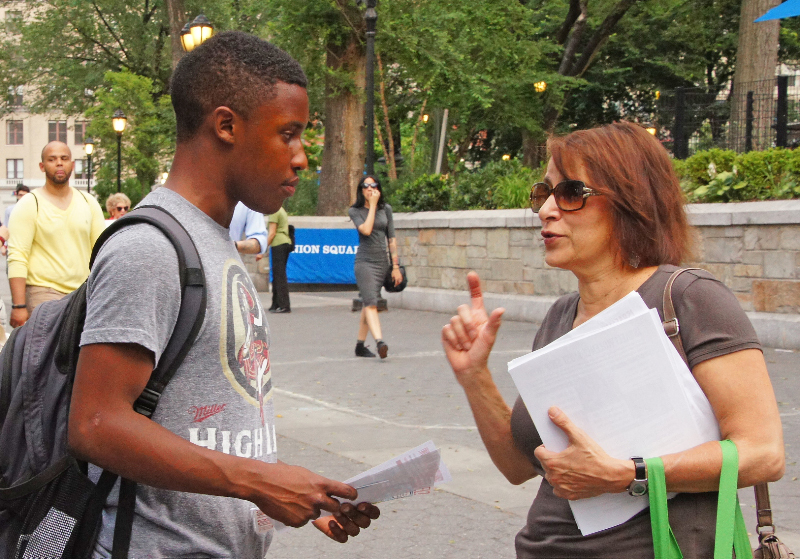 New York-based group, Jews Say No!, founded by Jewish boycott, divestment and sanctions advocate Donna Nevel,also takes a stance in full support of the BDS call. Other organizations include American Jews for a Just Peace, Breaking the Law of Return and the Committee for Open Discussion of Zionism, which “unequivocally” supports the movement.Jewish-American scholar and LGBT activist, Sarah Schulman has publicly declared her support for the BDS cause by advocating for the implementation of the boycott in its entirety. Udi Aloni, Israeli-American filmmaker also promotes BDS and the full goals of campaign. Similarly Jeremiah Haber (thenom de plume of Charles H. Manekin), an orthodox Jewish studies and philosophy professor dividing his time between Israel and the United States, backs BDS. Elsewhere in North America, Canadian group Independent Jewish Voices (Canada) has resolved to support the BDS call and urges the Canadian government to disengage from “its one-sided and uncritical support for Israel”. Naomi Klein, Jewish-Canadian journalist and author has likewise added her full backing to the BDS movement. The UK group, Jews for Boycotting Israeli Goods claims solidarity with “any individuals or organizations who share our anti-racist agenda in pursuing the non-violent goals of BDS”. 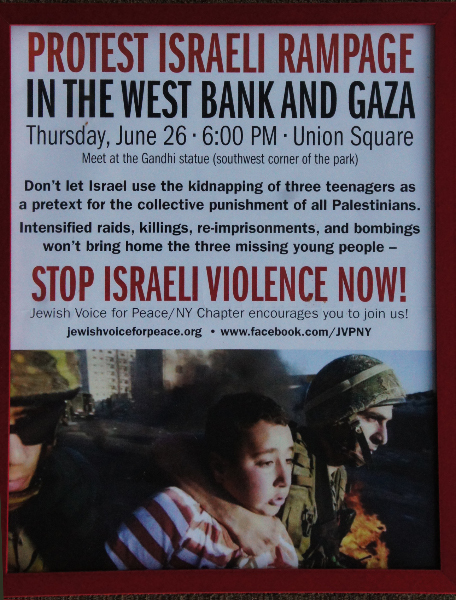 European Jews for a Just Peace also shares this support for the methods and goals of the campaign. 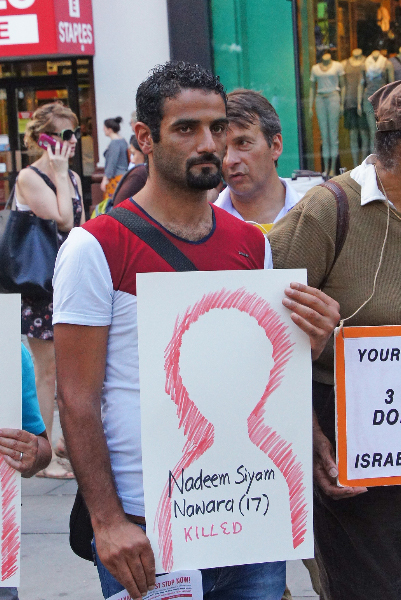 Australia-based Jews Against the Occupation also actively promote the BDS movement. 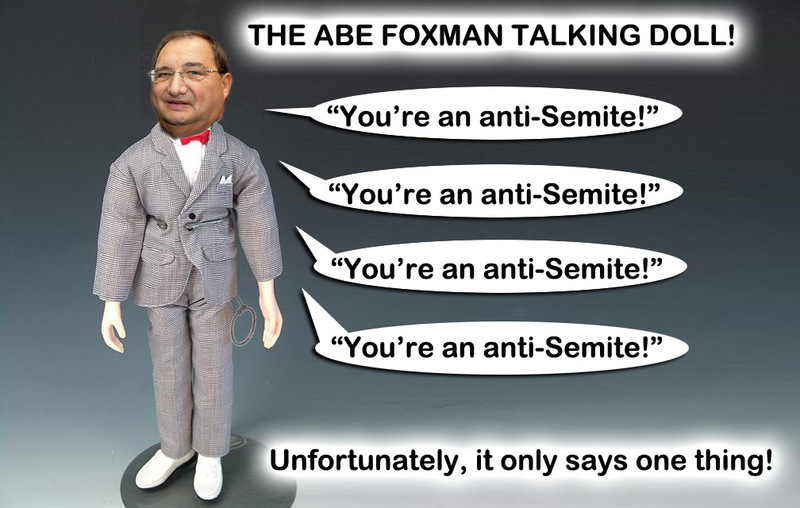 Sydney-based Jewish academic Peter Slezak supports the BDS call, as does Jewish-Australian journalist and author Antony Loewenstein, who is highly critical of attempts to label the nonviolent movement anti-Semitic. The International Jewish Anti-Zionist Network echoes these sentiments, declaring that BDS is neither anti-Semitic nor anti-democratic and that the international body “stands firm” in support of the full BDS call. Even within Israel, prominent individuals and organizations have pledged their support to the BDS movement and its vision of equality for Arab citizens of Israel, recognition of the Palestinian right of return, and ending the illegal occupation of Palestinian territory. The prominent group of Jewish and Palestinian citizens of Israel, BOYCOTT!, offers support for the Palestinian BDS call from within the Jewish state. The Israeli Committee Against House Demolitions and the Alternative Information Center likewise fully support the movement. Israeli Journalist, writer, and founder of the Alternative Information Center, Michel Warschawski, actively promotes BDS and has reiterated the call to Israelis to “boycott from within”. Rachel Giora, Israeli feminist and professor of linguistics at Tel Aviv University has also responded to the BDS call in a letter addressed to her colleagues at the British Committee for the Universities of Palestine, expressing full support for the movement. 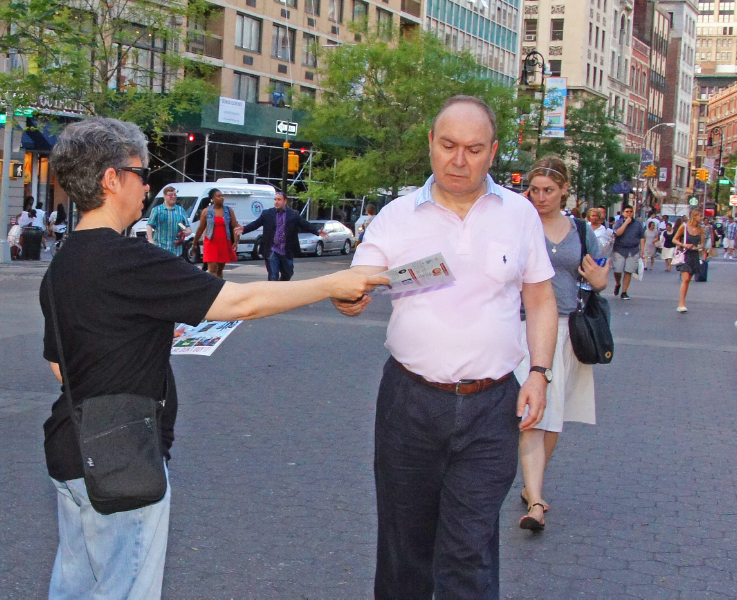 Other Jewish-Israeli academics in support of the campaign include historian and activist Ilan Pappé, anthropologist Uri Davis, political scientist Marcelo Svirsky, and anthropologist Jeff Halper. The most widely adopted mode of targeted support for BDS from within Israel and by Jewish individuals and organizations worldwide is a boycott of the Jewish-only settlements in the occupied West Bank (including East Jerusalem). This can include a boycott of products manufactured or grown within the settlements, or businesses and academic institutions located in settlements or actively supporting their perpetuation. 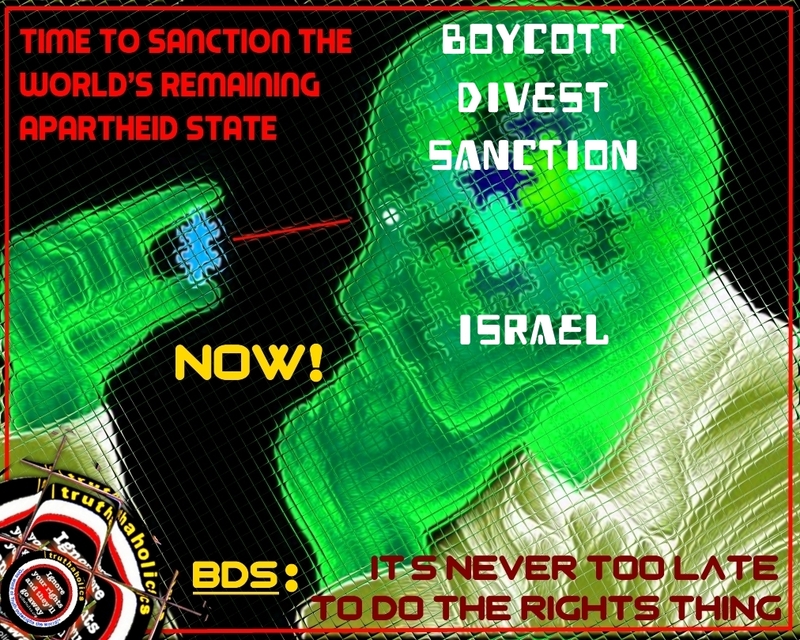 Reasons for why a narrow settlement boycott is preferred over a broader BDS include that international law is less ambiguous regarding the illegality of settlements (as compared to the BDS goals of the right of return, or legal equality in Israel) and that it is easier to consistently boycott settlements (rather than boycott broader Israeli or international organizations involved in abuses of Palestinian human rights). However even among Zionists who still support legally mandated disadvantage for Israel’s non-Jewish ethno-religious groups (required for Israel to be fixed as a “Jewish state”), the settlement boycott is gaining ground. As noted above, a recent survey by the Jewish People Policy Institute appears to show a growing tension within the international Jewish community regarding the idea that Israel can be both fundamentally Jewish and a democracy. Zionist boycott supporters typically differ from other boycott supporters in that they contend that even with the legally entrenched dominance of one etho-religious group (ie Jews) the state of Israel is still able to function as a “democracy”. These groups typically argue that the realization of the third goal of the BDS movement, the Palestinian right of return, would spell an end to the demographic and political dominance of Jews in Israel. For similar reasons they are also less supportive of the BDS movement’s goal of equality for Israel’s Arab citizens. These Zionist groups call for a more narrow boycott, of Israel’s Illegal settlements in the occupied West Bank (including East Jerusalem), in line with the first goal of the BDS movement. The rationale generally advanced by Zionists is that it is only with the end of the occupation of Palestinian territory that Israel can preserve both its Jewish and ostensibly “democratic” character. Notably, in 2006 the Israeli peace activism group headed by Uri Avnery, Gush Shalom, published “a list of several hundred products made in areas beyond the Green Line. The list, comprised of many food products, also included businesses operating in the Golan Heights.” In the face of the 2011 Law for Prevention of Damage to the State of Israel through Boycott passed by the Knesset, the group stated that it could no longer afford to continue publishing the list, for fear of the threat of lawsuits. The law would allow for lawsuits to be filed -without any proof of damages- against those who promote boycott tactics against people associated with the state of Israel or any “area under its control”. Gush Shalom appealed to Israel’s Supreme Court to rule the law as unconstitutional, and was joined by several other notable minority rights groups, including The Civil Rights Association, Yesh Din, Adalah, the Women’s Coalition for Peace, The Movement for Reform and Progressive Judaism, Knesset member Ahmed Tibi and The Arab Monitoring Committee. Israeli peace group Peace Now has published a similar list of settlement products and likewise calls for a boycott of the settlements. Israeli politician, Zahava Gal-On, head of the Meretz opposition party, has also publically declared that she boycotts the settlements in her own purchases and hopes that a boycott campaign on settlement goods would encourage Israelis to think critically about the “economic cost of the Occupation.” There are signs that the boycott of settlements among Israelis, has begun to cause manufacturers and producers in the West Bank and East Jerusalem to “encounter obstacles” marketing goods “not just overseas, also in Tel Aviv”. 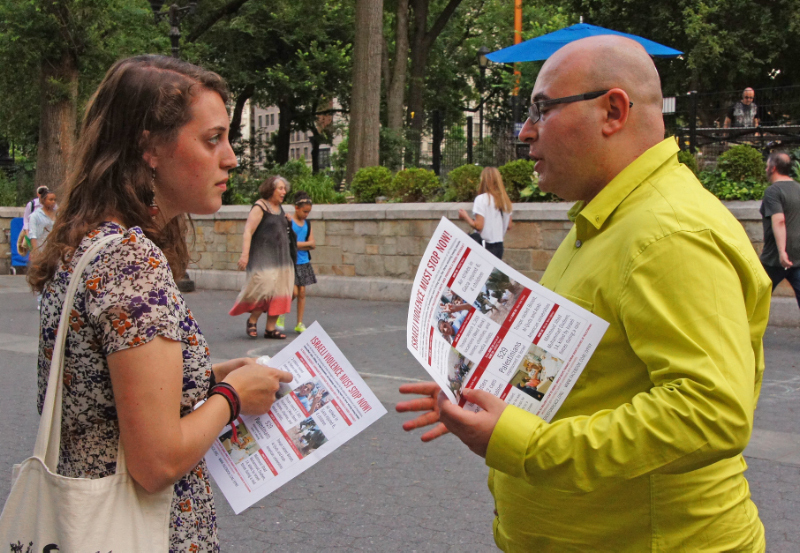 Support for a settlement boycott is also building among U.S. Jews. Distinguished Jewish-American jurist Richard Falk, as UN Special Rapporteur on human rights in the Palestinian territories, has recently formally recommended that UN member states and businesses and civil society impose sanctions and boycotts against Israeli settlements and international corporations supporting the occupation of Palestinian territory. Back in 2011, the American Liberal Zionist organization Partners for Progressive Israel (then Meretz U.S.A) issued a call to American Jews to boycott West Bank settlement goods through their campaign: “Buy Israel – Don’t buy Settlements”. Americans for Peace Now, describing themselves as a pro-Israel, pro-peace, American Jewish organization,echo this support. Similarly, even other Zionists, who ostensibly oppose the broader BDS campaign, do support a boycott of the settlements. Well-known American Liberal Zionist Peter Beinart for instance has repeatedly written in support of a settlements boycott in order to “save Israel”. Beinart advocates a targeted approach to boycotting West Bank settlements. Addressing American Jews, Beinart declared: “We should lobby to exclude settler-produced goods from America’s free-trade deal with Israel. We should push to end Internal Revenue Service policies that allow Americans to make tax-deductible gifts to settler charities. Every time an American newspaper calls Israel a democracy, we should urge it to include the caveat: only within the green line”. Jeremy Ben-Ami, President of the influential liberal pro-Israel lobby group, J-Street also recently announced that if the BDS campaign were restricted to a boycott of the settlements J-Street would support it. Similarly, National President of Ameinu Kenneth Bob has declared that while he does not support the BDS movement he is “extremely sympathetic to the settlement boycott approach”. The New Israel Fund, through a statement their Vice President of Public Affairs from Naomi Paiss, has also shown support for the same type of targeted approach, stressing that “boycotting settlements is not anti-Israel”. After a visit to the West Bank, Rabbi Ellen Lippmann issued a statement reversing her initial opposition to the settlement boycott and claiming solidarity with Israeli rabbis who also support a boycott of settlement goods. Jewish-American political scientist and activist Norman Finkelstein supports an economic boycott of Israel in order to compel Israel to end its illegal occupation of Palestinian territory (also see the start of an interview with Finkelstein posted here). Prominent linguist, philosopher and activist Noam Chomsky has also publicly spoken out in support of BDS as a tactic, saying: “There is an interesting mythology that I have opposed the BDS movement. In reality, as explained over and over, I not only support it but was actively involved long before the ‘movement’ took shape…” Chomsky specifically supports boycott and divestment from companies that operate in the occupied Palestinian territories and also promotes forms of academic and military boycott. Among the Jewish Diaspora in Australia, Ben Saul, Professor of International Law at Sydney University has written in favor of a targeted boycott approach focused on the Jewish-only settlements. What’s more, The Australian Jewish Democratic Society “has become the first Australian community-affiliated Jewish organization to adopt the view that some boycotts of Israel may indeed be justified.” The group supports “selected BDS actions designed to bring about an end to the Israeli occupation, blockade and settlement on Palestinian lands lying outside of the June 1967 Israeli borders.” The organization resolves to boycott settlement products as well as “specific academics openly supportive of the Occupation”. Support for BDS methods also takes the form of refusal to perform in the Jewish-only settlements on occupied Palestinian territory. In 2010, over 50 Israeli actors, directors, and playwrights released a statement declaring that they would not perform at the new theatre in Ariel, Israel’s fourth largest settlement, or in any other settlement. In a show of support for that petition over 150 Israeli academics and university faculty from across Israel released their own open letter, vowing to likewise engage in a cultural and academic boycott of the settlements. The Israeli academics declared: “We will not take part in any kind of cultural activity beyond the Green Line, take part in discussions and seminars, or lecture in any kind of academic setting in these settlements.” Signatories include Zeev Sternhell, Anat Biletzki, Shlomo Sand, Neve Gordon, Oren Yiftachel, among others. The declaration was also supported by several prominent Israeli authors, A. B. Yehoshua, Amos Oz, David Grossman, and Sami Michael. A letter drafted by the authors, as well as by well-known Israeli memorial sculptor and Israel Prize laureate, Dani Karavan, expresses further solidarity with the actor’s boycott. Theodore Bikel, a Jewish American actor, has also been vocal in the settlement boycott also joined a separate petition for the boycott of the settlements, signed by over 150 Israeli entertainment professionals. Another aspect of the BDS movement is the boycott of Israeli academic institutions: specifically, the withdrawal of support from Israeli academic institutions complicit in the illegal occupation of Palestinian territory and the violation of Palestinian human rights. This movement draws on a growing body of evidence detailing academic institutions support for the occupation of Palestinian territory and violation of human rights (including education rights) through a variety of military and public relations oriented research and training activities. 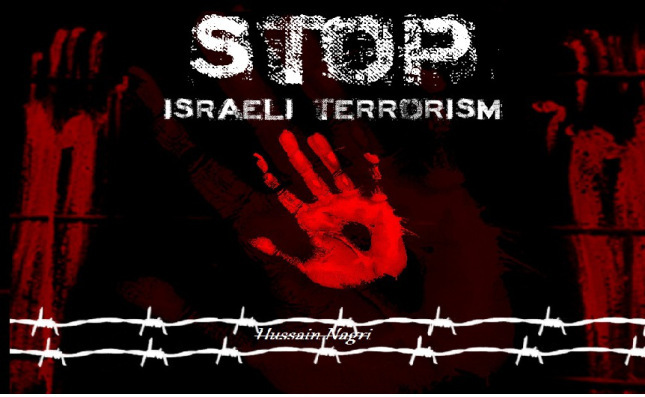 One such in-depth report was released by the Israeli Alternative Information Center in 2009. The Palestinian Campaign for the Academic and Cultural Boycott of Israel (PACBI) was launched in 2004 to challenge the unethical policies of these institutions. However boycotts of Israeli academic institutions to promote Palestinian human rights also predate the PACBI call. In April 2002 a call “for a European Boycott of Research and Cultural Links with Israel” was signed by around 700 Europe-based academics, ten of which are Israeli academics from various universities. More recently, in 2013 in response to the PACBI call a group of Israeli, Palestinian and other oral historians and academics from Europe, South Africa, Oceania, Asia, and the Americas issued an international call for the boycott of the “International Oral History Conference” organized by The Hebrew University of Jerusalem. In February this year, an international Jewish group, Jews for Palestinian Right of Return, published a list of signatories endorsing and supporting the American Studies Association academic boycott. Israeli and international Jews have likewise joined the boycott of the 2014 Cinema and TV Studies Conference held at Tel Aviv University. Jewish-American academic, Colin Dayan has also written in support of a boycott of Israeli academic institutions as has Malcolm Levitt, professor at Southampton University and a fellow of the Royal Society in the UK. Levitt as well as Noam Chomsky joined a group of academics who successfully lobbied physicist Stephen Hawking to boycott the IsraeliPresidential Conference held in Jerusalem last year. A number of Jewish and Israeli academics and organizations support BDS activities in forms other than the academic boycott (such as through a settlement boycott, support on the grounds of free speech, or in support of the full BDS Call), signifying that there other forms of boycott activity at play within the academic world. Two instances of this last year were Kings College and the University of Southampton in the UK dropping their contracts with security firm G4S, in response to the British security firm’s role in supporting the Israeli occupation and abuse of human rights. Earlier this year human rights group Amnesty International published a report that recommended an international military boycott of Israel, citing the country’s “use of excessive force in the West Bank”. The conclusions of this report (and similar research efforts) lay out the rationale for the military boycott of Israel. One example of this is the movement within Israel in opposition to the military draft. In March of 2014, The Israeli youth group, Conscientious Objectors of the Occupation, released an open letter addressed to Israeli PM Benjamin Netanyahu “declaring their refusal of compulsory service in the Israeli military” because of their opposition to the Israeli occupation of Palestinian territory. Another boycott movement within the military sphere is the call for the disinvestment of international companies and organizations that are part of the Israeli military-industrial-complex (such as the efforts by Kings College and the University of Southampton noted above). This military boycott is often included within broader BDS policies. The Australian Jewish Democratic Society statement of support for targeted boycotts for example also advocates for “divestment from military Research and Development (R&D) and boycott of industrial/military activities unrelated to Israel’s defense and security.” Noam Chomsky has also called for an end to U.S. and other international military aid to Israel. Elsewhere, in a letter opposing political censorship, over 150 U.S.-based academics, spearheaded by Jewish academic Judith Butler, and Rashid Khalidi, signed a statement condemning the “accelerating efforts to curtail speech, to exercise censorship, and to carry out retaliatory action against individuals on the basis of their political views or associations, notably support for BDS.” Calling on support from cultural and educational institutions to uphold and support “the principles of free expression”, the authors point out that “as non-violent instruments to effect political change, boycotts cannot be outlawed without trampling on a constitutionally protected right to political speech.” Even Israeli Foreign Ministry officials, “pro-Israel” lobby organizations such as Israel-based NGO Monitor, and most of the mainstream press in Israel have stated they oppose efforts to stamp out BDS through the courts. The Executive Council of Australian Jewry, and other senior Jewish leaders in Australia have made clear they oppose attempts to suppress BDS through litigation, which they view as counter-productive. Elsewhere in Australia other pro-Israel organizations the Zionist Federation of Australia and the Australia/Israel & Jewish Affairs Council have also refused to support anti-BDS efforts through the courts..
Paul Duffill is a part-time lecturer and researcher at the Centre for Peace and Conflict Studies at the University of Sydney. He is also project manager for an inter-university human rights curriculum project lead by the University of Sydney. Gabriella Skoff is a graduate of NYU where she majored in religion, politics and war. She is currently an intern at the Centre for Peace and Conflict Studies at the University of Sydney. The following report from The Forward is worth reading as well…. “I used to believe that BDS is an idealistic and not a realistic approach,” said Holly Bicerano, a Boston University student activist. 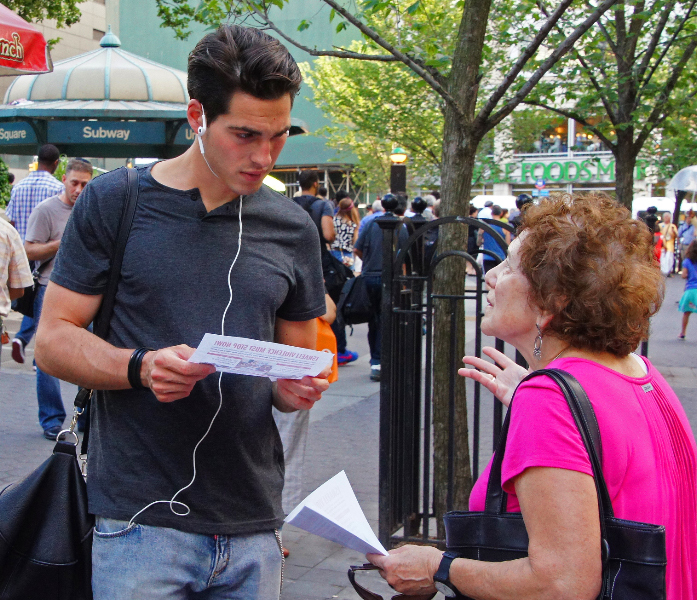 Bicerano, who helped found a pro-Israel campus group called BU Students for Israel, recently switched over to Jewish Voices for Peace, a pro-BDS Jewish organization. “When the peace talks collapsed I reached the conclusion that BDS is the practical way forward,” she said. Buy one of these while supply lasts …..
As if they were allowed to …. One side of the wall is open for inspection …. the other is not! Be sure to read THIS post before you continue ..
Israeli Prime Minister Benjamin Netanyahu criticized the Presbyterian Church (U.S.A.) vote to divest from three companies that do business with Israeli West Bank security forces. Netanyahu, speaking Sunday to Jewish journalists from around the world at the inaugural Jewish Media Summit in Jerusalem, said the vote late Friday to divest from Caterpillar, Motorola Solutions and Hewlett-Packard was misguided because Israel protects civil rights in a region with rising tides of Islamist extremism. “The only place where you have freedom, tolerance, protection of minorities, protection of gays, of Christians and all other faiths is Israel,” he said. The prime minister told the more than 100 Jewish journalists gathered for the five-day summit that he sees three threats facing the Jewish people worldwide — heightened anti-Semitism in Europe, weakened Jewish identity in the United States and the rise of radical Islamist forces in the Middle East. He lamented the June 12 kidnapping of three Israeli teenagers in the West Bank, as well as the death of a 13-year-old Israeli killed by an explosive Sunday in the Golan Heights. “We as a people, our heart is broken about the kidnapping of every youth and the murder of every youth,” he said. Netanyahu also repeated his call for the world to prevent Iran from attaining nuclear weapons capability. He connected Iran’s Islamic government to conflicts between Sunni and Shiite groups in Iraq and Syria. Speaking before Netanyahu at the summit, outgoing President Shimon Peres praised Palestinian Authority President Mahmoud Abbas’ condemnation of the teens’ kidnapping and said Abbas is a good peace partner for Israel. Peres encouraged Israel to restart peace talks, which Israel suspended in April after Abbas signed a reconciliation pact with Hamas, the terrorist group that governs Gaza. Netanyahu said earlier Sunday that Israel has clear evidence that Hamas participated in the kidnapping. The Jewish Media Summit, which was organized by Israel’s Government Press Office, is set to occur every two years. More than 25 countries are represented at the event, according to Israel’s Ministry of Foreign Affairs. 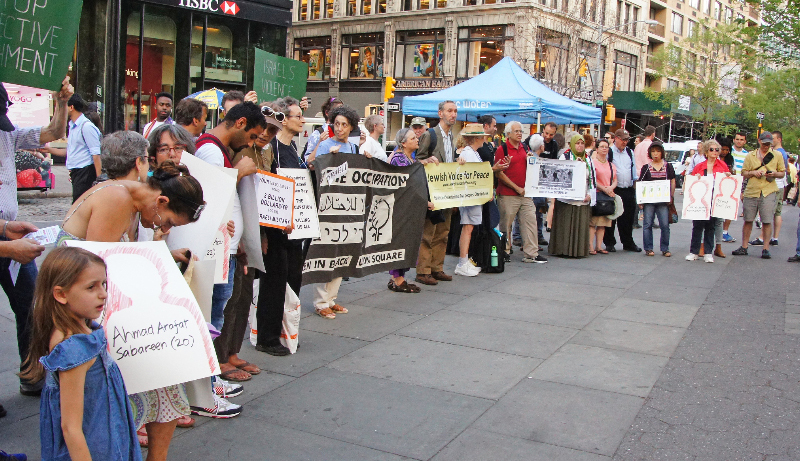 Church members recognized the bankruptcy of the opposition, but that they also understood the facts on the ground and knew that these facts compelled Church divestment from the Occupation. In the U.S. movement for justice in Palestine, the Presbyterian General Assembly vote Friday to divest is a major turning point. It represents the first time that a large mainstream U.S. church took a formal step to do what it’s able to do to end the Israeli Occupation. 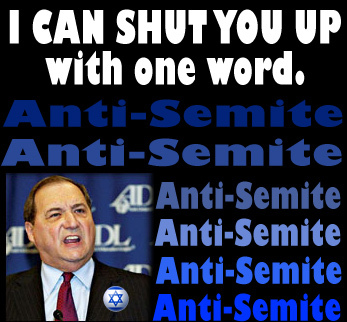 Perhaps even more important in assessing the impact of this event for the U.S. public, it reflects recognition by the rank-and-file church representatives — its General Assembly, comprised mostly of rank-and-file church members – that the conservative and militant Zionist U.S. opposition to the BDS movement relies only on name-calling and guilt-tripping, rather than fair and reasoned argument on the merits of their position. Opponents of the divestment proposal wore t-shirts bearing the slogan: “Love us, don’t leave us!” The opposition arguments heard again and again at the plenary were threats that the adoption of the allegedly “anti-Semitic” proposal would anger and alienate the U.S. Jewish community from the Church. Not one argument was heard in defense of the merits of their position. Proponents of the proposal, in response, appealed to the Assembly to do justice, to have the courage to place their values above their fears of being accused of anti-Semitism. These appeals by proponents to the conscience of the voting rank-and-file Church membership were what carried the day. The victory was for this reason far more significant than it appeared to be, as reported in mainstream media. It showed not only that rank-and-file Church members recognized the bankruptcy of the opposition, but that they also understood the facts on the ground and knew that these facts compelled Church divestment from the Occupation. Mondoweiss reporter Allison Deger was on the scene and tweeted that protestors werechanting slogans against the Palestinian Authority. The incident in Ramallah comes amid growing Palestinian anger at PA collaboration with the violent Israeli crackdown in the West Bank which Israel has launched under the pretextof searching for three Israeli youths who went missing in the West Bank on 12 June. Israel says the youths, two of them minors, were kidnapped but has offered no evidence to support its assertions that Hamas was behind their abduction. No group has claimed responsibility. As the latest Israeli rampage of murder and terror in the West Bank continues unabated, hopes for locating three young Jewish settlers Israel says were kidnapped by suspected Hamas militants are steadily vanishing. Tens of thousands of Israeli troops are taking part in one of the largest operations in Israel’s history. So, far troops have thoroughly searched more than a thousand Palestinian homes in the Hebron region alone, but to no avail. 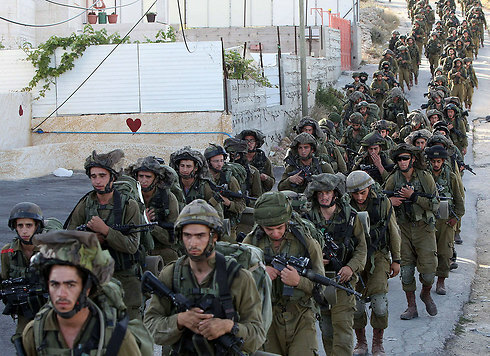 Soldiers have also been searching wells, abandoned caves and other possible hideouts in the large Hebron district. In many cases, troops blast their way into Palestinian homes, using explosives. The aggressive and unnecessary measure, which often takes place in the quiet hours before dawn, is obviously intended to terrorize Palestinian civilians and inflict on them maximum emotional pain and material losses. Few instances of beating have been reported. However, there have been numerous reports of vandalism and sabotage of public and private property. There have also been widespread reports of theft by the troops, including stealing Jewelry, money and other valuable items. An Israeli army spokesman admitted that “tens of thousands of Shekels were confiscated” from Palestinians suspected of being sympathetic with Hamas. Neither Hamas nor any other Palestinian faction has claimed responsibility for the presumed kidnapping. Despite the ferocity of the Israeli campaign, there are signs that the Palestinians are caving in under pressure. Indeed, many Palestinians, especially in the Hebron region, are showing definitive signs of defiance, often invoking the adage: whatever falls from the sky will hit the ground. While Israel is making a huge outcry about “Jewish children kidnapped by Palestinian terrorists,” Israel soldiers have murdered at least six Palestinians. The victims include a 13-year old child from the town of Dura, south west of Hebron. According to several eye-witnesses Muhammed Jehad Dudin was gunned down Friday morning, while standing outside his home, watching soldiers raid his neighborhood. “He was just standing with other kids. He threw no stones, he did nothing to provoke the heavily-armed soldiers,” said Ahmed Raba’i who said he witnessed the incident. Interestingly, the murderous killing of Dudin was mentioned rather tersely by the Israeli media, which Palestinians say underscores the shocking apathy of the Israeli public toward Palestinian lives. In the course of the past few years, Israel has killed more than 400 Palestinian children, mostly in the Gaza Strip. In most cases, the murderous killings were carried out knowingly and deliberately. 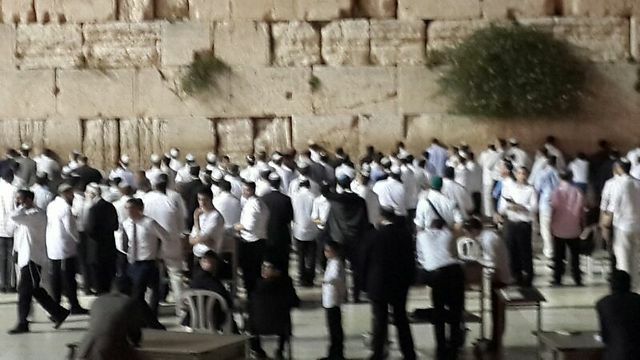 Some Talmudic circles in Israel teach that the lives of non-Jews have absolutely no sanctity. Many Israeli soldiers, especially those graduating from religious schools or Yeshivot, are indoctrinated in this brashly racist ideology which views non-Jews as quasi-human beings or animals in a human shape. Elsewhere in the West Bank, trigger-happy Israeli troops killed Mahmoud Atallah when Palestinian youngsters hurled stones on Israeli troops who raided Ramallah, the capital of the Palestinian Authority, Saturday night. And in Nablus, another youth named Ahmed Khaled was murdered in several circumstances. 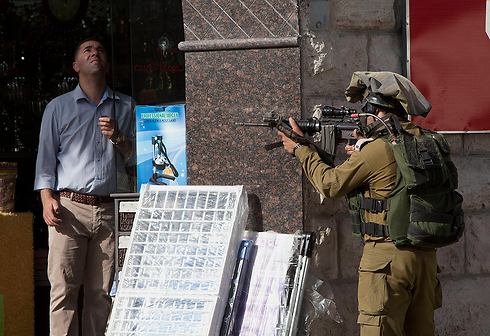 Israeli troops on Sunday stormed Ramallah anew as PA security personnel looked on. Meanwhile, it seems that the latest events in the West Bank have dealt a strong blow to PA Chairman Mahmoud Abbas’s popularity amongst Palestinians. Last week, Abbas referred to the missing three Israeli settlers as “three innocent children.” He made no mention of Palestinian victims of Israel’s criminal colonialism and apartheid, including thousands of Palestinian political and resistance prisoners, many of them languishing in Israeli jails and detention camps without charge or trial. “What national interest is served by murdering our children in old-blood such as what happened in Dura yesterday? “What national interest is served by rounding up hundreds of innocent people who have done nothing wrong? “What national interest is served by raiding and vandalizing our homes, businesses, institutions and orphanages? It is widely believed that Abbas’s sagging popularity is met with the an ostensibly rising popularity of Hamas, the Palestinian Islamic liberation movement Israel has been trying to demonize. It is hard to verify the veracity of these claims. However, from the latest Palestinian public reactions, it seems that most Palestinians are willing to give Hamas the benefit of the doubt, at least for the time being. And this is happening at Israel’s and Abbas’s expense. Many Arab doctors treat army and police officers devotedly despite the fact that the latter have likely killed their people and hurt them. We have also cared for people who probably expropriated our lands, or drivers of bulldozers destroying al-Arakib and the unrecognized villages in the Negev. Because being a doctor is a mission. A doctor is a human, before being Jewish or Arab. Japanese have cared for Americans, and vice versa. Op-ed: MK Dr. Ahmad Tibi writes open letter to Israeli physician who expressed his reservations over caring for Palestinians following kidnapping affair. Several years ago, the IOF (Israel Occupation Forces) bombed Gaza. The three daughters of Dr. Ezzeldeen Abu al-Aish were killed as his house was bombed. At the exact same time, he was treating Israelis – some of them soldiers or their family members who harmed his people, and some of them settlers who robbed his people’s land. Even after his daughters were murdered in the bombing, Dr. Abu al-Aish did not lose his humanity. He remained a doctor. In a Channel 10 report by Smadar Peled, a physician named Dr. Dudi Mishaly said that until now he has had the privilege of operating on children and healing them, including Palestinian children. Now, after the kidnapping, the settler doctor revealed that he is more of a settler than a doctor. He sees caring for a Palestinian child from Hebron as “an act of a bleeding heart” or even a “pretentious act.” That’s right! Well, she probably hasn’t heard about the fate of 13-year-old Muhammad Dudin who was shot to death several days ago by the occupation soldiers searching for the missing-kidnapped teens, who I hope will return safely to their families. The child Muhammad Dudin will never return to his family. I remember encountering many hostile patients who noticed that my name is Ahmad. I have even cared for people who called me names on nationalistic grounds because I did not see my medical mission as “pretentious” or an act of a bleeding heart. By the way, I have never asked to be thanked for a treatment or help I gave. Medicine is a value which depends on the person, not on one’s nationality or political views. It’s true that a doctor is also a human being with feeling and opinions, but he is tested in his ability to push his opinions aside and not to express them openly. Dr. Mishaly, I don’t want to demand your dismissal from treating children because, as you said, you have been coming to work “with a depression” recently. A depressed doctor can be an oppressing doctor. I am certain that there will be other doctors, both Jews and Arabs, who will agree to do what you find difficult doing: Operating on Palestinian children. Take a vacation, go back to your settlement, which sits exactly on the lands of the family of the Hebron child whose treatment you question, and enjoy the fake feeling of belonging to a collective of self-righteousness, disowning, crying and showing off. Get out of the Palestinian land. Get out of our souls. 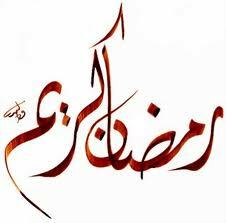 And to you I would like to dedicate Mahmoud Darwish’s song, “Passers between the Passing Words.” It’s time for you to be gone – ايها المارون بين الكلمات العابرة خذوا اسماءكم وانصرفوا.